I'm back on schedule with my weekly blog. This week I talk about the plant kingdom, and my experiences with drawing them. 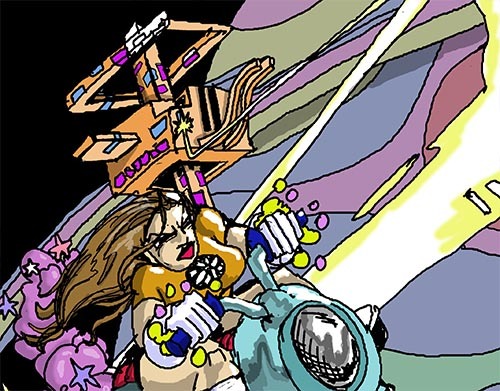 More Universe Gun next weekend, with Chapter 3: Chasing the Rainbow! In the meantime, this week's blog looks at a few recent character sketches, and some experiments away from my tablet with >gulp!< real pens! Cool. 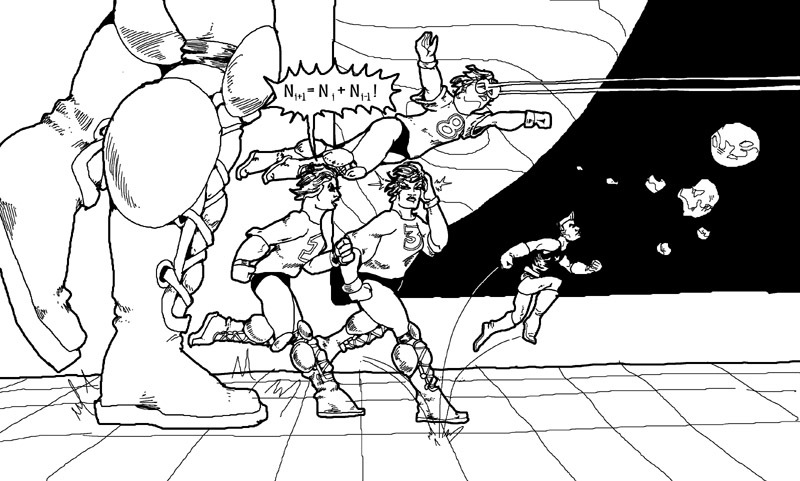 Yeah, I'd never heard of Hyperactives until today, let alone drawn them. I had a quick Google search, but couldn't find any of the alternative world scenes. The main art looks to be very J Scott Campbell influenced - all the girls have the same nose. Universe Gun is the first actual long form comic I've produced, so its really nice to hear that I'm reminding you of some proper commercial work. Thanks! my mistake but i still consider you as profesional as any established comic artist, always enjoyed your style in your games. Chapter 3 is up! 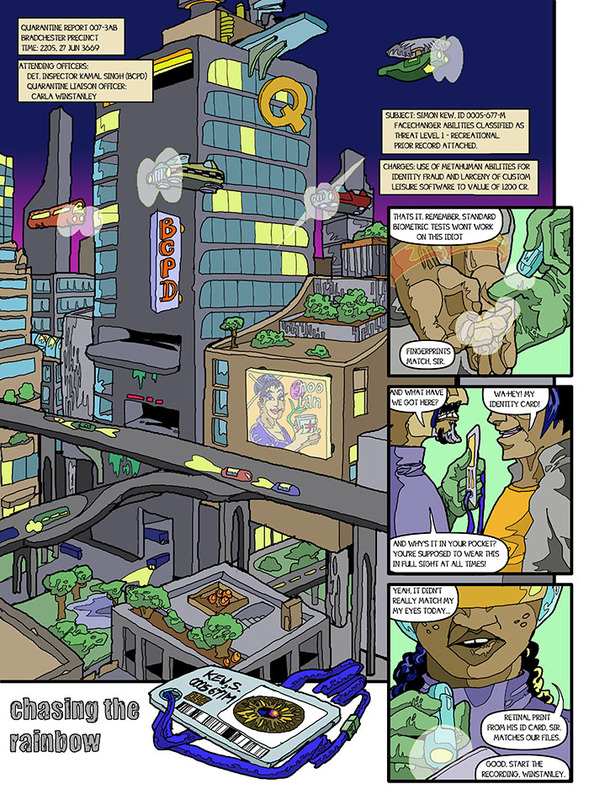 Issue 1: Mars concludes with "Chasing the Rainbow" as we delve into the seedy world of recreational superpower use and policing. Loving your style on these -- it's like you threw Moebius, Jack Kirby, and Zap Comix in a blender. Haha, now that's a cool description! Thanks, JK! There's also a tweaked layout to www.universegun.com and a new blog entry about the amazing movies of Tarsem Singh. More Universe Gun talk next week! Very nice. Interesting article about Singh. The only movie I saw was Immortals, which might be the worst movie I ever saw in a theatre with the Clash of the Titans remake. Mind you, this was mostly due to the awful story and dialog, and poor casting. As its script was written by different people, I guess I'll do have to check The Fall. Yeah, Immortals had some cool visual bits, like the minotaur and labyrinth, and the caged titans in Tartarus, and the first appearance of the oracles, but the story was very by-the-numbers and toned down. The fact that all the Gods, even Zeus, looked around 20 didn't help lend it any gravitas either. It was like watching a really good comics artist illustrate a really poor script. I was hugely disappointed by it. 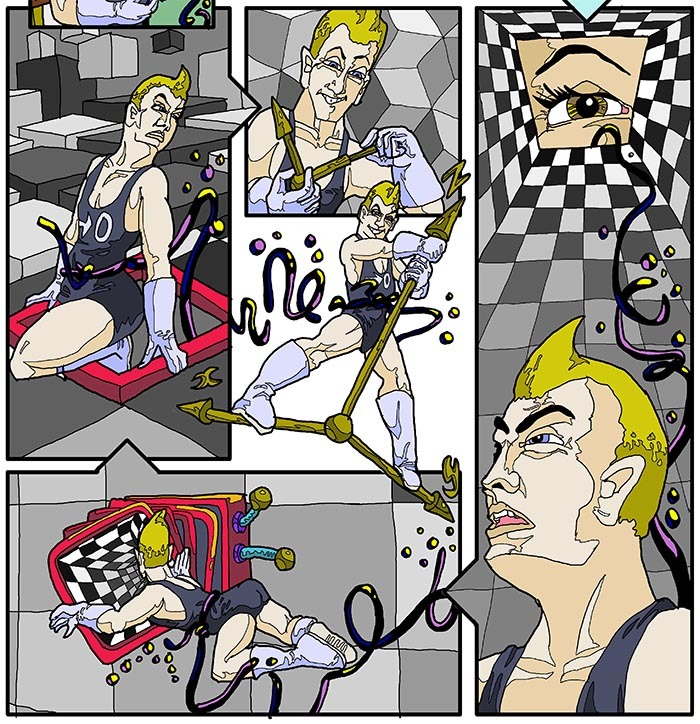 This week's blog at www.fundamentzero.com discusses what I mean when I say I'm writing a psychedelic superhero comic. 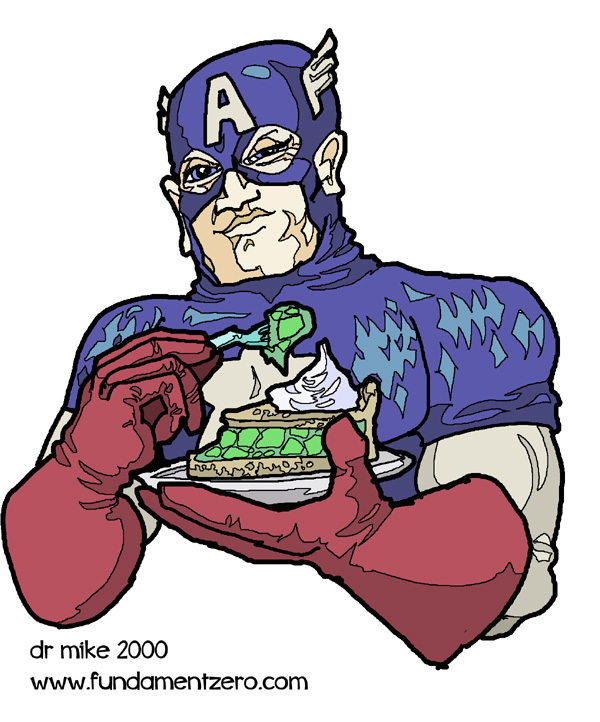 A new blog entry delves into the murky world of metahuman mealtimes on fundmanetzero.com! Thanks, MJB. The feeling's mutual - after all, you're up in the Links section on Fundament Zero! A midweek blog this time round, where I discuss Space Travel, get a bit sniffy about the physics and diss Captain Kirk! Check out www.fundamentzero.com for details! 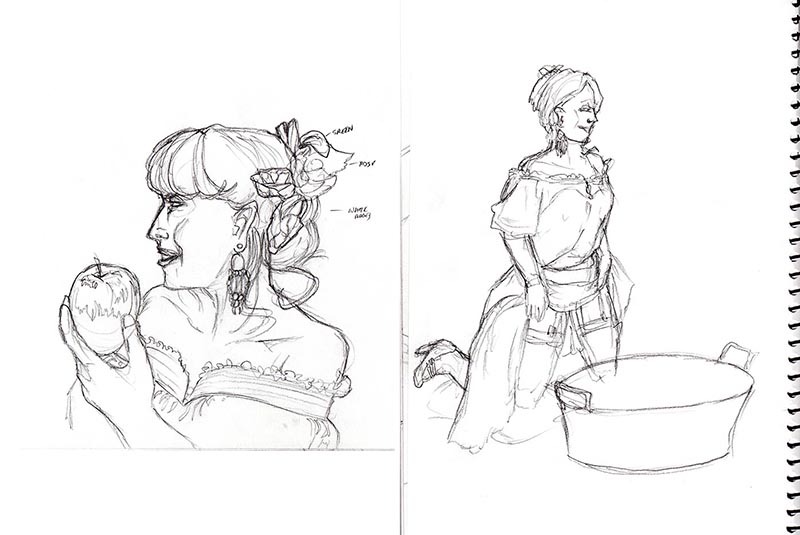 A few more sketches, and a new blog entry on simple lighting effects. 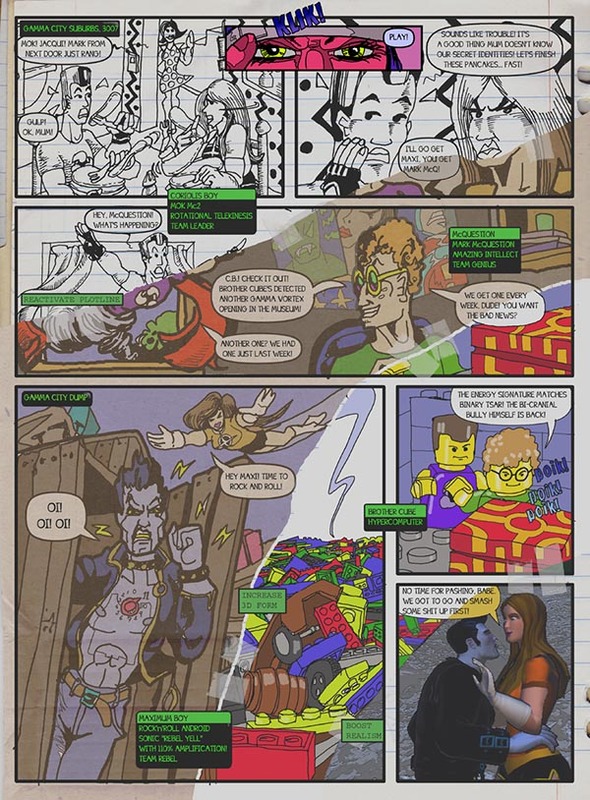 More blogginess at www.fundamentzero.com as I discuss maths, superheroes and 1970's fashion. Tales of the Navigator players may remember references to the art of Algebra Cadabra, I haven't quite let go of those ideas still. Late last year I wrote and drew a 9 page black and white strip called "Pazuzu! ", a sort of sci-fi mathematical Dr Strange story, if you like. It's been picked up by the Indie Comics Quarterly anthology to be published in late May! More about that in the blog. Extremities - drawing hands and feet! Can't make a comic with 'em, can't make one without 'em! 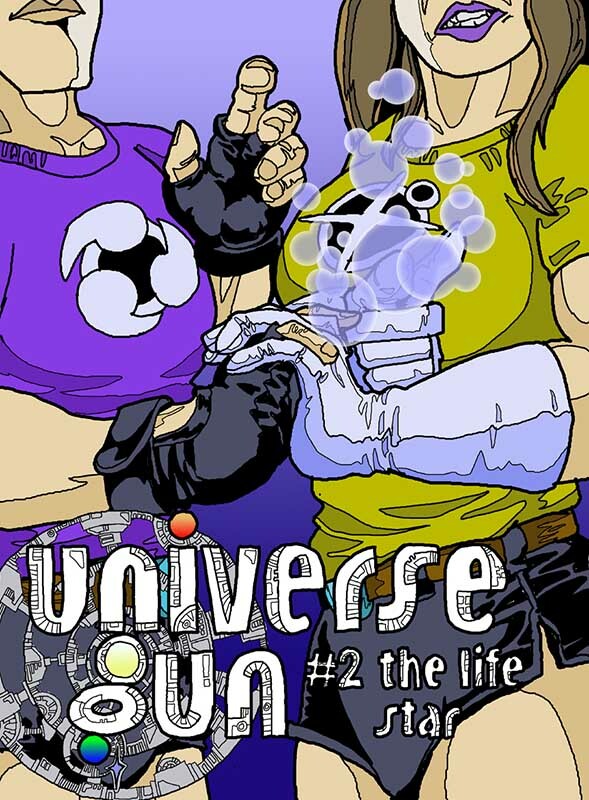 And speaking of hands, here's the hand-centric cover for Universe Gun #2, which kicks off next week! Issue #2 kicks off today with Monsters of the Heroic Age! Delve into the mysteries of the Life Star, and QMAC, the organisation dedicated to shielding the Earth from it! And on an unrelated note, here's a picture of the Wizard of Oz gang! I hadn't heard about Woodroffe, that's a great shame. I can see the influence on your work, the tone at least if not the actual style. Yeah, I'd forgotten that Zardoz was an abbreviation for the Wizard of Oz the second time I watched it, it surprised me again. I was very happy when this idea occurred to me for a weekly draw-off with Oz as the topic. Woodroffe's death was I think overshadowed a bit by H.R. Giger a couple of days after. Both great artists, but Giger was associated with some massive film properties, like Alien. 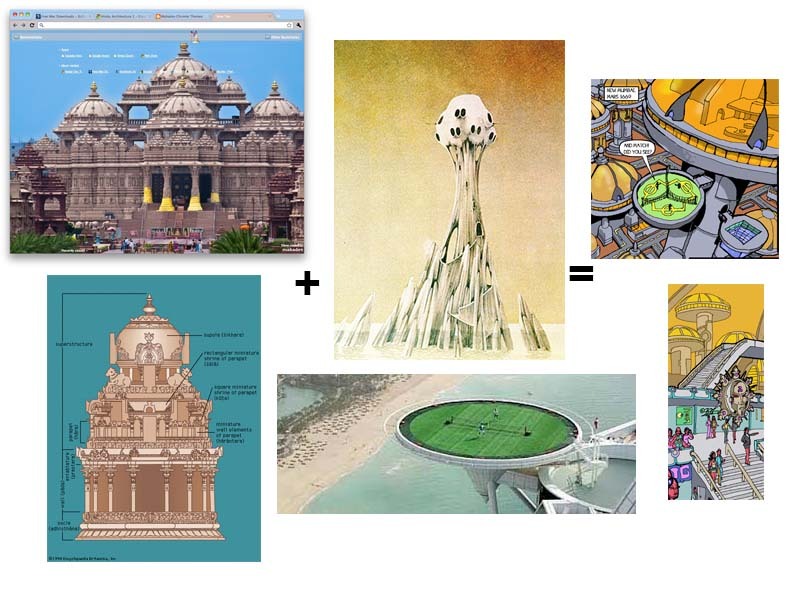 Its funny, I wonder what a science fiction movie with Woodroffe at the helm would have looked like? Off the top of my head, Terry Gilliam and Marc Caro (City of Lost Children) probably come closest in style and tone. 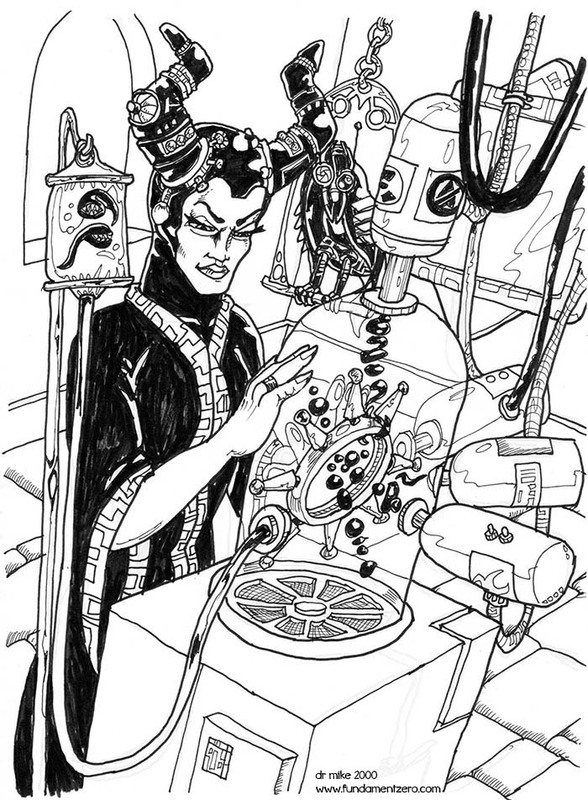 It all started mistakenly with this science fiction Maleficent sketch. There's just a quick blog update this weekend, and 8 new sketches added to the front page. Higher Dimensions and a short side project? Read all about it at www.fundamentzero.com in this week's blog entry Lost in Phase Space! Dr. Mike, I just wanted to say I read through Universe Gun and I absolutely love it. 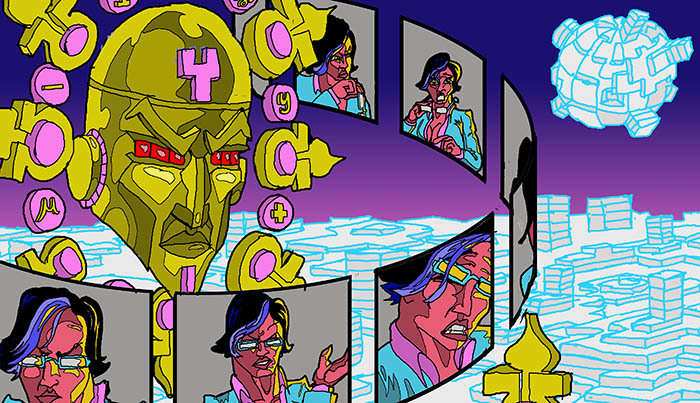 Not only is your art style funky rad, but your character designs are a perfect blend of classic and psychedelic, and your world building is superb. It's great to hear that people like what I'm doing here, and that it makes sense beyond the echo chamber of my head. I'll be working on a Universe Gun poster tonight, now with renewed energy thanks to you taking the time to write! I'm in no danger of stopping soon. I've got another four 7 page chapters ready to publish already, and plan to keep this up for a few more years. I'm estimating 10 issues = 210 pages all up by the time I'm finished with Universe Gun. I've installed new comic reader code on my site, and written a short blog on today's life drawing adventures. Where? Why, www.fundamentzero.com of course!